Last weekend was spring break and the plan was to just head down to St.George for the weekend. Things changes once we got invited to go to California to a beach house.....there was no way we could pass that up. Tiffany had work on thursday until 3 so we could not leave Orem until she got off. Once she got off we headed down to St.George to pick up Taisha because she wanted to come with us. We picked Taisha up and the food my mom got us to take on our trip wouldn't be so expensive (what a nice nice mother I have). Anyways so we left St.George at about 8:30 and started our 7 hour journey to San Clemete CA. We drove and drove for what seemed like forever then at about 2 a.m. we arrived in CA. We were all just so tired we went right to bed. Friday Taisha and Tiffany went down and walked the beach while I still slept for a bit. Then I got ready and went longboarding with some of the guys that were with us. After that we all headed down to the beach to play for a bit. I was kind of disappointed because it was cloudy and all I wanted was to get a tan. However that didn't work out too well. We wanted to try to go find some sun so we packed up and headed up to Newport beach for a bit....still no sun. We just hung out there for a bit and took pictures and such. We left Newport and went down to San Diego where we decided to spend the rest of the weekend. Saturday we went to the USS Midway Museum. It is like a navy ship I guess that is now a museum. It was pretty cool I am not going to lie. We had lots of fun taking pictures in there and riding the plane simulator. It was like I was flying a real navy plane. Then we just spent the rest of the day on the beach because there was actually sun, but I still got no tan what so ever. 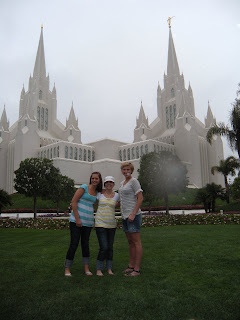 Sunday we packed up all of our stuff and went to the San Diego Temple. I think that temple is my favorite temple ever! After the temple it started raining so we just decided to head home. Tiffany got sick, so I was stuck driving the WHOLE way home!! It was so boring and not fun at all! Now we are back to our everyday lives. I survived the long drive! I wish I was still in California though.